A beautiful smile can do so much more for a person than simply improve who they see in the mirror. For many, the smile is where their confidence starts. 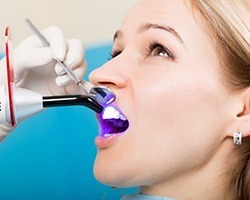 Of course, many others feel held back by their teeth, whether due to stains, chips, cracks, or gaps. A student of the prestigious Las Vegas Institute, Dr. Castleberry has studied extensively how to create gorgeous, natural-looking smiles using the treatments detailed below. Whether you just want a touch-up for a special event or a complete transformation, he can make it a reality in just a few simple appointments. If you’re ready to get the smile you’ve always wanted, contact us today. They are always custom-made to bring out the best qualities in a person’s smile and face. You can get just one or a complete set to achieve a dramatic result. Lumineers are very similar to porcelain veneers in that they can be used to address numerous aesthetic flaws at once, but there is one big difference: they go onto the teeth as is. Porcelain veneers require a very small amount of enamel to be removed in order to lay flat against the teeth, but with Lumineers, this step is unnecessary. 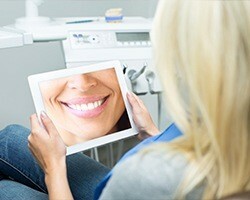 They provide one of the best ways to drastically enhance the smile in the least amount of time. When it comes to repairing a damaged front tooth, strength, durability, and beauty are all equally important. To achieve this balance, our practice only uses metal-free restorations. These crowns, inlays, and onlays are made of 100% dental porcelain, which is well-known for its ability to look and function just like real enamel in every way. With this material, Dr. Castleberry can create a restoration so lifelike, even YOU will have trouble seeing where your real tooth ends and the dental work begins! Want a quick fix for that one stain, crack, or gap that has driven you crazy for years? With direct bonding, Dr. Castleberry can take care of it in as little as an hour! After applying a color-matched composite resin to your compromised tooth, he’ll skillfully sculpt and polish it to perfection. 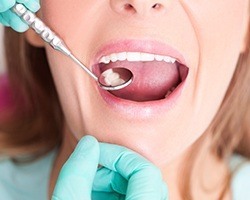 This treatment is not only fast, but painless as well, and the results can be trusted to look great for over a decade. 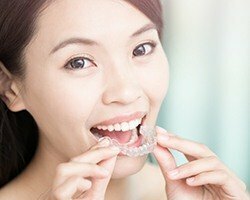 Have you always wanted to straighten your teeth, but the thought of getting braces prevented you from doing so? With Invisalign, you can finally get the straighter smile you’ve always wanted without sacrificing your professional appearance. This system uses a series of clear plastic aligner trays to shift the teeth in the most discreet and comfortable way possible. They are practically invisible on the teeth, and when it’s time to eat or brush, you can simply take them out at your convenience. Is your smile looking a little less than white lately? Want to change that? With Zoom! in-office and take-home whitening, we can easily help you brighten your smile by up to EIGHT shades! This system combines a powerful bleaching agent with a low-UV light to break up even the most stubborn stains in record time. Whether you get a fast treatment in-office or use one of our customized kits, the end result will be the same: a pristinely white set of teeth you’ll love to show the world. Every painting needs the right frame, and every beautiful smile needs a gum line that compliments it. 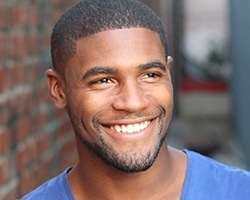 For some, their smile is burdened by an over-prominent gum line, causing their teeth to look short and stubby. Fortunately, Dr. Castleberry can quickly address this problem using a soft tissue laser. With it, he can painlessly remove excess gum tissue and shape the gums along the teeth to help patients achieve that perfectly proportioned look they desire, often in just one appointment. Before you choose to get cosmetic treatment, we want you to have all the information you need to proceed confidently, which is why we’ll create your own “Before & After” photos using digital imaging. With a picture of your current smile, we’ll manipulate it to show how a specific treatment will change its appearance so you can have a better idea of what to expect. If you like what you see, great, and if not, this presents the perfect opportunity to ask for any adjustments you want.